Welcome to Eidet Sjøcamp's web site! The winter season 2018 starts at the middle of february and ends in the beginning of april. ​Summerseason starts beginning of may. Last year was fantastic for people who like to go fishing. The fishermen from Germany caught 5 halibuts, the biggest with 42 kilos was a troufé. The ideal period for hobby fishing is the month of march to june. Then the days are long and it is not cold. 15 degrees centigrades in the sun and 8 degrees or more in the shadow is rather common. This is due to the Golfstream. 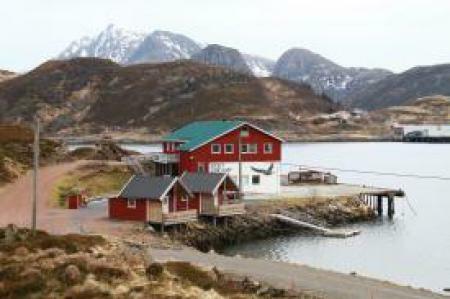 In Northern Norway, in the land of the midnight sun, Eidet Sjocamp offers you a site filled with tranquility. Situated on the boarder of the fjord which is surrounded by high mountains, you can observe a multitude of spieces like: sea eagles, puffins, different kinds of seagulls, seals, otters, dolphins and cormorans. Last december was special, then there was a family og killer whales visiting our fjord several times. The last day they were very close to the quay. You also have the possibility of taking long walks in the mountains or along the coast with a splendid view over the sea with its magic colors, or the changing colors of the cloudy sky. You can choose different ways of spending the night at Eidet Sjocamp: Tenting, rooms, huts and rorbus (fishermen's hut) are possibilities available. Do you have a caravan or a mobile home you'll find all you need, electricity, water and sanitary compost, in addition you can emty your chemical toilette. You can rent a boat if you want to go out fishing, or you can try to catch a fish from the shore with a fishing rod. You can also visit some small islets with white sand beaches where people have settled hundreds of years ago, now deserted. You can visit the reminiscences of ancient constructions; quays and boat houses. You can also see the groundwall of resant buildings. The last inhabitants left some fifty years ago to join the population where the electicity had already been introduced. You may also have a bath in an outdoor tub with warm water for 6 to 7 persons. There is an open grilhouse surrounding the tub where you can have your BBQ-party. If you wish to heat the water yourself, it will take about 8 hours and cost NOK 500,-. ( Firewood is aditional) . Very special is the visit to the cave where the local author Regine Normann had to hide her writings from her husband, the perish clerk. He was more reigious than the pope and did not allow her to write. Some pupils showed her this cave where they often had fun in the dark. When they had fun, she wrote, and she hid away her writings befor leaving.